“Vietnam” has been a contested idea for a long time. As an American History teacher, I tend to offer my students a compelling look at the American government’s military intervention in Vietnam from the early 1960s to the mid 1970s. Over the course of two weeks with teacher colleagues from all over the country and with the help of some equally impressive university scholars I came to understand how of part of Southeast Asia known today as Vietnam has a long history as a contested place. I want to now re-evaluate the when in which I teach about Vietnam to my future classes. I selected this image because for me it conveyed what a long process Vietnam went through in order to exist presently. It is a place to me as a teacher that tells a much larger story than simply the American war in Vietnam. It’s a story of process from colonization to revolution that spans many centuries and has several links to different places and peoples. In order to contextualize Vietnam as more than just the site where Americans were sent from 1954-1975 we need to tell the more complicated story of the history of the place, and that’s why I selected this image as my humanities moment. It’s a great primary source to summarize the different approach that I gained from my time in that seminar. It’s a propaganda poster from “Operation Freedom” which was done by the United States Information Agency in order to convince people from North Vietnam to escape communism by moving below the 17th parallel. Everything about this image to me is a reminder of how contested this land had been. The words themselves, all in the style of the Vietnamese Latin alphabet, can tell a remarkable story of how this country emerged in the cross-currents of South East Asia. The communist flag, the images of a destroyed yet oppressive North, the green, serene wet rice agriculture of the South offer students a lot to unpack. Why was the country divided? When was this produced? What role did the United States have in Vietnam and why would they produce this? Do you think this changed people’s minds? All questions that need to be answered by examining the history of Vietnamese and not of the colonial actors. 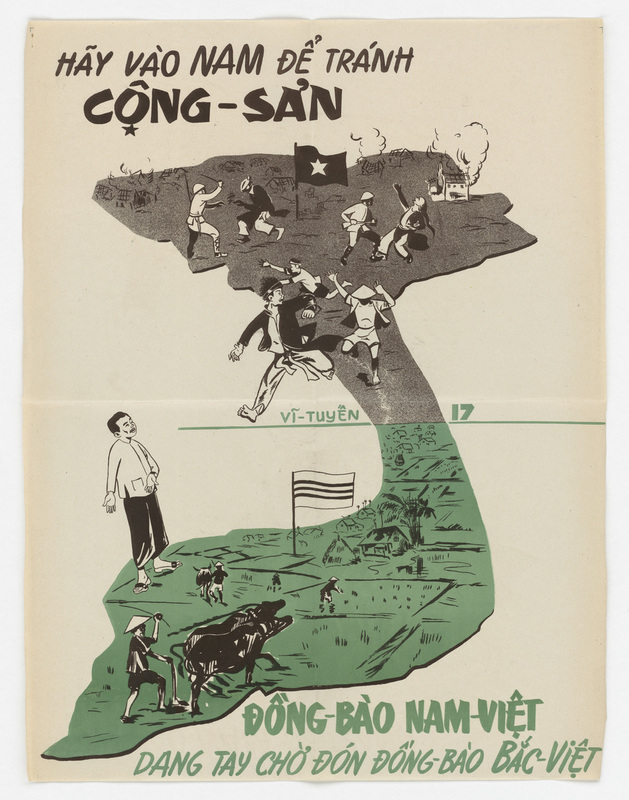 The words are also a powerful message telling the viewer in Vietnamese: “Go to the SOUTH to avoid COMMUNISM” and that “The NAM VIỆT compatriots are waiting to welcome their Bắc Việt compatriots with open arms.” What assumptions did the American propaganda designers make? What is different about the country in the North versus the South? There is so much to explore about Vietnam itself through this image rather than doing a unit of the exclusively the American government or military, and forces my students, as well as myself to confront a much different history of Vietnam by including an understanding of how Vietnam was not just something acted on by outsiders, but how it was in itself, a place composed of a number of different ethnicities, religions as people in order to teach a more complete history in my curriculum of how Americans ended up there.